For every student, the first and second degree separated, Miss Heřtusová has prepared a forum about a life in Africa, in the countryside and in the town with commented projection of photos and videos. Especially interesting was to see the school, which is attended by adopted children, the possibility of ask about manner of teaching, school tools, the organization during ordinary day, etc. After that, there was workshop based on materials of Centre Narovinu, for example The Tale of Africa, Surroundings of picture, Painting of Mask, Clothing in Africa, Rythms of Africa, What can/can‘t do the world,… Miss Heřtusová brought many materials – pictures, clothes, work papers. It was really successful day and we are grateful for that. The lecture was held in order to motivate other students to be involved in adoption, because some of students from second grade that had been participating in adoption for many years are leaving the school for next studies. Other students are not interested about adoption. The lecture was really interesting and catching. Herculean performance of Simona Heřutová, who had to handle all lecture without microphone, was admirable. For motivation of students, there is necessary to have one motivated teacher, whose we are missing at this time (after teacher Jaroslava Chalupná has left the school). There is not enough time during classes for co-operation with Centrum Narovinu. In addition parents of children are in worse finance situation now. This is directly related to school expenses which are higher now. Because of these reasons, the motivation of students and their parents for co-operation in project for developing countries is poor. Unfortunately even after the lecture we didn’t manage to recruit many students interested in adoption. We regret that we found out we can’t continue to support two African boys in their studies. We really thank you for well-prepared workshop modified for age of our students in our centre. The topic of workshop was modified for our demand. “Global family” is the theme we are discussing now in our classes. We appreciate the professionality and willingness of lecturer and her creative attitude during lecture because we had many problems with our technical stuff. Children enjoyed a lot this lecture, it was full of videos, activities with pictures, colouring books, changing clothes or carrying things on the top of their head. They were talking a lot about this lecture even long time after that. Thank you very much! Centre Narovinu is co-operating with Český rozhlas (Czech radio station) with realization International Art Competition for children from 2006, thus it has been 7 years. This year a lot of children from Kenya sent pictures to this International Art Competition and it was really interesting which motives these children put into their pictures in comparison to other children. 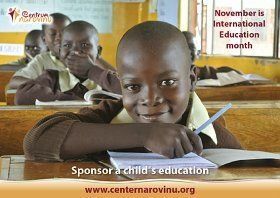 Centre Narovinu contributes annually a lot to program that enriches opening preview for children, parents and teachers. This year participants had an opportunity to try African clothes and mask or to finish surroundings of African picture. Every year there is always a lot of photos and videos of Kenya. These materials help a lot to make sense to pictures from Kenyan’s children and to understand the environment where these pictures have been done. In 2003 we broaden our co-operation and we organized beneficent action of victorious pictures from International Art Competition for children organized by Radio Junior (Český rozhlas) named: We draw along the net. The gain was donated to children in Rusinga Island (Island of Hope), specifically to the fund for reconstruction of school canteen, which is really in need. We manage to gain by this beneficent project 6 780 Kč. Centre Narovinu organized everything perfectly and we are prepared to collaborate and make the same beneficial project again next year.